Tonight I walked Ardenwood Boulevard (from Paseo Padre Parkway to Jarvis Avenue) and Jarvis Ave. (from Ardenwood Blvd. to Gateway in Newark). 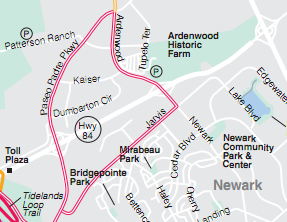 These two streets (both shown as double red lines on Bay Trail map) form two sides of a Bay Trail triangle Bay, east of the San Francisco Bay, with Paseo Padre Parkway (and a bit of Thornton Ave.) forming the third side. I passed the Ardenwood Historic Farm, but it was closed. The farm acreage is surrounded by housing and railroad tracks to the north, and Highway 84 and shopping centers to the south. This much open land being preserved in agricultural form was a rare and wonderful sight. There was also a produce stand (Perry's Fresh Organic Produce, off Ardenwood); however, I believe it was closed for the evening as well. Walking in an urban area like this with generous sidewalks and street lighting made it easy to decide to walk later, to beat the heat. I waited until the cooler, evening hours to start my stroll. And it was much more pleasant. The only disadvantage: evening walks make capturing the experience in photos a bit more difficult -- since I don't walk with any extra weight or photo gear, such as a tripod. Of course it's especially challenging if I forget my camera entirely -- which I did. So, I have no pictures of this area. I may go back and snap a few if I have time later. 7 sea gulls; 7 crows; 1 mockingbird; 24 little brown jobs (LBJs); 2 snowy egrets (flying overhead); 1 great blue heron (flying overhead); 2 ducks (flying overhead); 1 snail; 1 moth; 6 unidentified flying bugs (that I hope weren't mosquitos). Notes: Use caution when walking across intersections on Ardenwood that are also Highway 84 freeway off-ramps and on-ramps. Also, while the sidewalks along both these roads were great for pedestrians, the bicycle lanes were a bit on the narrow side in some spots.